Since its independence, in 1821, Guatemala claims sovereignty over the south part of what was then the British Honduras, now Belize. Since then, no agreement has been reached on the delimitation of the borders between the two countries. This situation is at the roots of the illegal intrusions of Guatemalans in Belize, threatening the Belizean environment, especially in protected areas. Roughly 26 percent of Belize’s area is protected as national park, forest reserve or private reserve, in a total of 96 protected areas. The main way for Guatemalans’ intrusions in Belize is the Chiquibul National Park. Chiquibul National Park, Belize‘s largest National Park, lies in the Maya Mountains which culminate at Doyle’s Delight, the highest point in Belize (1,124 m above sea level). It encompasses an area of 1,073 km2, one-seventh of Belize’s territory. 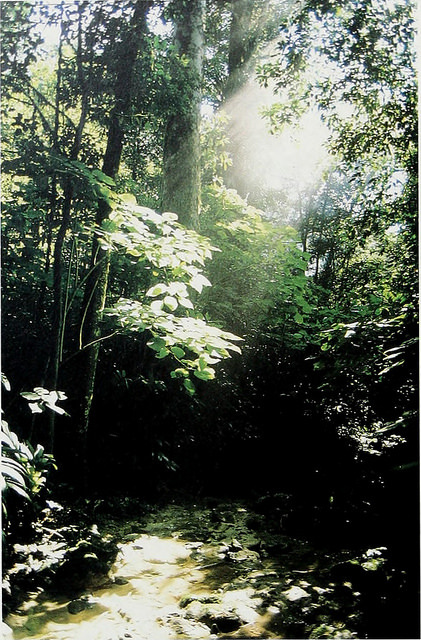 The park was established in 1991 on the parts of the Chiquibul Forest Reserve where they were no logging concession. 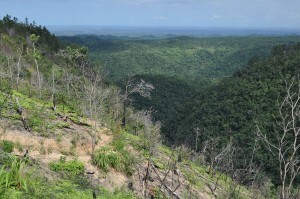 The area of the National Park was about three quarter of the area of the forest Reserve. In 1995, the Mayan Archaeological site of Caracol has been into the National Park. The Park belongs to the category II of the International Union for Conservation of Nature (IUCN). The National Park is mainly covered by forest. It has a high biodiversity. Among the species found in the National Park are keel-billed motmot (Electron carinatum), kinkajou (Potos flavus), jaguar (Panthera onca), jaguarundi (Puma yagouaroundi), king vulture (Sarcoramphus papa), margay (Leopardus wiedii), ocelot (Leopardus pardalis), ocellated turkey (Meleagris ocellata), Yucatan spider monkey (Ateles geoffroyi yucatanensis), and Baird’s tapir (Tapirus bairdii), this last animal being the symbol of Belize. The National Park hosts the largest breeding population of Scarlet macaws (Ara macao) in Belize. The biological diversity of the park has not yet been fully explored. In 1993, a botanist from Missouri Botanical Garden collected more than 130 plant species previously unreported in Belize. The main part of the Chiquibul Cave System, the longest known cave system in Central America, lies in the National Park. This cave system is composed by three major caverns, the lengths of which are 14 km, 13 km and 5 km. The total length of the system is 55 km. Here can be found the largest cave room in the Western Hemisphere and the fourth largest in the world. The National Park is invaded by Guatemalans, which clear plots for farming, trap wildlife for sale, dig gold placers and log tropical wood. Some incursions go as far as 45 kilometres inside Belizean territory. 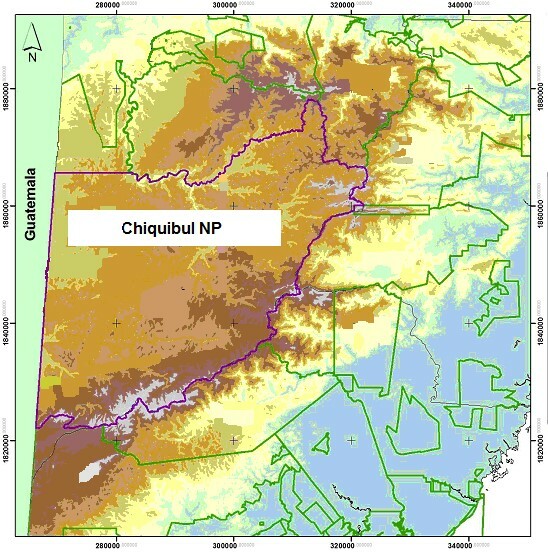 The Chiquibul National Park is, since 2007, managed by the Friends for Conservation and Development (FCD) and Belize Forest Department. FCD has an annual operating budget of just $230,000 (to be compared with the 33 M$ budget of Yellowstone National Park, in the United States). It manages conservation posts in the park and performs weekly patrols to combat poaching and other resource extraction. The park hires nine rangers to patrol the Park and survey the 45 km border between Chiquibul National Park and Guatemala. Lack of access roads, on the Belizean’s side, make the monitoring of the area very difficult. 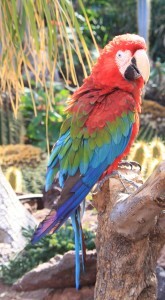 The Scarlet macaw (Ara macao, Linnaeus, 1758) is a bird nearly 1 metre long from beak to tail feathers. It is a locally endangered species. It is estimated that only 200 birds are still living in the wild in Belize. The birds are captured at a very young age to be sold as pets in the illegal pet trade market. The process results usually the death of the majority of the hatchlings that are taken. In 2011, about 89% of the nests in the Chiquibul Forest were poached. Poaching accounts for 27% of the breeding failures in Scarlet macaw populations. On the black market, the price of a Scarlet macaw can reach 2,000 BZD (980 CHF). Large areas of the forests are cleared for milpa farming, thus destructing ecosystem habitats of several plants and animals. According to an article published in Tropical Conservation Science, in 2007 “satellite imagery indicated that in the Chiquibul National Park alone, 3,126 hectares of tropical forest have disappeared.” The financial loss for Belize is estimated at a million dollars annually. A reconnaissance flight, in 2015, has located 27 milpa farms within the National Park. Xateros harvest the leaves of the Xaté palm (Chamaedorea ernesti-augusti). This plant that is also poached from Belize’s jungle is used for floral arrangements. According to the International Union for Conservation of Nature (IUCN), approximately 75% of Chamaedorea are considered threatened. Wild xaté plants produce only one or two new leaves per year. Bundles of 600 leaves are sold 38 USD (37 CHF) for Chamaedorea ernesti-augusti and 10 USD (9.8 CHF) for Chamaedorea elongata. In 2015, more than 11 million leaves of both species have been illegally collected, representing a value of near half-million USD (480,000 CHF). Many xateros are armed and ready to fight with Belizean law enforcement. In 2014, Tourism Police Officer Danny Conoroquie was shot dead by Xateros. The Chiquibul area has an important mining potential. During the 1980’s, gold prospecting began in the Ceibo Chico area of the Chiquibul National Park. A prospection and exploitation license has been issued in 1999to Boiton Minerals/Erin Ventures Inc. (part of Ceiba Resources Ltd.). The exploration license covers a total of 34 km², and the mining license 0.39 km2. It has been extended in September 2007, to 1.6 km2. Orion Company possesses also a concession in the National Park. Gold also attract Guatemalans which practice illegal panning in the National Park. In July 2012, Rafael Manzanero, Executive Director of FCD, estimated that about three hundred people were extracting gold in the Ceibo chico area. The illegally extracted gold is sold 150 GTQ/g (19 CHF/g). Illegal wood logging targets mainly mahogany (Swietenia macrophylla King) and cedar (Cedrela odorata L). It was observed for the first time in 2006. According to R. Manzanaro, the loss for Belize is estimated at 15 millions USD (14.7 millions CHF) in 2011 and 19 millions USD (18.4 millions CHF) in 2015. The area impacted by illegal logging has grown from 180 km2 to 460 km2 between 2010 and 2015. The problem dates from 1839, when Guatemala started claiming sovereignty over south of Belize. The 12,272 square kilometers of disputed territory south of the Río Sibún encompasses more than half of the former British colony. Several times, in 1945, 1972, 1975, and 1977, Guatemala threatened to invade but was to face British military power. Belize is independent since 1981. Only in 1991 did Guatemala establish diplomatic relations with its neighbour. The two countries reached, in October 2008, an agreement planning that each country would hold, on 6 October 2013, a referendum among their respective citizens, on whether to take the dispute to the International Court of Justice in The Hague. But Guatemala decided in 2013 not to fulfil this decision. Guatemala has about 16 millions inhabitants (2014 estimation), against 350,000 (2015 estimation) in Belize. 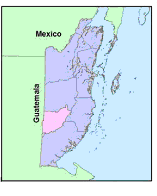 Respective population densities are 130 inhabitants per km2 for Guatemala and 14 inhabitants per km2 for Belize. Belize is the most sparsely populated country in Central America. The political dispute over the border and the lack of agreement between the two countries has opened the way to large-scale environmental crimes. Mountain Wilderness urges the two concerned parties to definitively settle the question and insure the respect of national and international regulations regarding the preservation of the environment. Culture associating maize, beans, squash, also called Three sisters.